A rendering of the Park James Hotel. NATIONAL REPORT—Dallas-based Hall Structured Finance (HSF) has closed a new, $26-million, first-lien loan to finance the construction of the Park James Hotel in Menlo Park, CA. 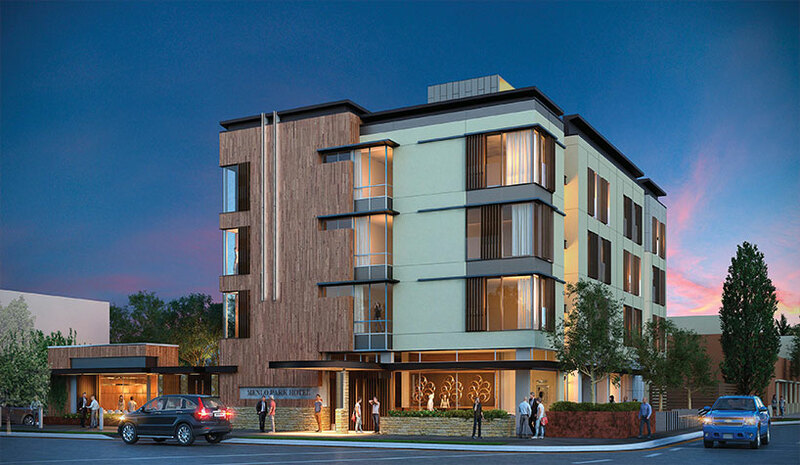 California-based Pollock Realty Corp. is developing the 61-key boutique hotel. The hotel will feature a restaurant, lobby bar, landscaped courtyard to accommodate outdoor meetings and events, and 1,200 sq. ft. of indoor meeting space. Broughton Hotels will manage the property. “The Park James Hotel will offer travelers sophisticated, upscale accommodations with a unique, local influence and culture. Guests can walk to nearby downtown Menlo Park or easily access any of the top Silicon Valley businesses,” said Jeff Pollock, SVP of Pollock Realty Corp. This is the third construction loan that HSF has closed in California this year. It recently closed a $42-million loan to develop two Cambria Suites in Napa Valley and Sonoma County. In Utah, hotel owner/operator MCR acquired two Marriott hotels in Lehi, a suburb of Salt Lake City, for $27.5 million. The Courtyard by Marriott Lehi and SpringHill Suites by Marriott Lehi are situated at the entrance to Thanksgiving Point, Lehi’s central business and leisure hub, which is known for its technology businesses, museums and entertainment facilities. Lehi, situated between Provo and Salt Lake City, has more than doubled in size since 2000, and is home to a large cluster of technology companies including Adobe, Microsoft, Oracle, Ancestry.com and others. Year-over year growth for the city in 2016 was 4.6%. HREC Investment Advisors is offering qualified investors the opportunity to acquire the fee-simple interest in the 127-key Comfort Suites South Fort Wayne located at 5775 Coventry Lane. The hotel is located off of Interstate 69 and the Fort Wayne International Airport is eight miles south of the property. It opened in 1996 and was renovated in 2005. The property features 2,800 sq. ft. of meeting space, a business center, fitness center, swimming pool and sundries shop.